It was inevitable that if the young filmmakers associated with mumblecore couldn’t capitalize on the phenomenon at the box office someone else would. Films like The Puffy Chair (2006), Baghead (2008), and Humpday (2009) were all expected to become commercial successes, but all of them fizzled badly. Noah Baumbach, who somewhat surprisingly produced Joe Swanberg’s Alexander the Last (2009), shot his latest film Greenberg (2010) with mumblecore mainstays Mark Duplass and Greta Gerwig. Just as John Schlesinger turned themes that Andy Warhol was exploring in My Hustler into the Academy-Award winner Midnight Cowboy (1969) with Jon Voight playing a male prostitute, so too has Focus Features’ Greenberg mined territory similar to mumblecore, while far exceeding the success of probably all of those films combined. Greenberg, in a limited theatrical release, has already grossed $3 million domestically. Of course, I’m being deliberately provocative in my analogy. Noah Baumbach is hardly John Schlesinger, and none of the mumblecore directors are in the same league as Andy Warhol. But the surprise here is less that Baumbach’s Greenberg is a modest commercial and critical hit than the fact that he has managed to turn Greta Gerwig into an overnight star. A. O. Scott’s glowing article on Gerwig in the Sunday New York Times two weeks ago might have seemed over the top to many people. He writes: “Ms. Gerwig, most likely without intending to be anything of the kind, may well be the definitive screen actress of her generation, a judgment I offer with all sincerity and a measure of ambivalence. 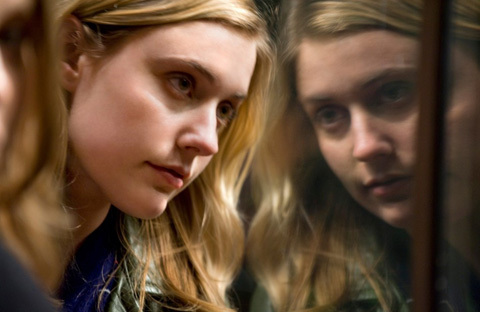 She seems to be embarked on a project, however piecemeal and modestly scaled, of redefining just what it is we talk about when we talk about acting.” Because acting is the one aspect of a film about which people most disagree, I’m pretty sure that The New York Times received a great deal of flack over this claim about Greta Gerwig. There are several different types of film acting. “Star” acting aside, Hollywood acting, as embodied by someone like Meryl Streep, is the kind in which the artifice is completely evident in her performance. Every emotion is being telegraphed to us as viewers. In other words, when watching such performances, I’m always aware of exactly what the performer is doing – there’s never really a suspension of disbelief. Indeed, the performance in question is judged precisely on recognizing the divide between actor and role. Did you really believe for a second that Jon Voight was a male hustler? Probably not, but mainstream viewers appreciated his characterization rather than its sense of realism. Think of Sissy Spacek and Tom Wilkinson in the scene where the Fowlers rip each other to shreds in Todd Field’s In the Bedroom. That’s Hollywood acting, as we watch how the two veteran actors build their performances step by step. I’m not saying that what they are doing isn’t powerful or emotionally affecting – with artifice it is always a question of degree. In Gus Van Sant’s My Own Private Idaho, there’s the scene where Mike (River Phoenix) tells Scott (Keanu Reeves) that he loves him as they sit by a campfire. The scene is painful and embarrassing to watch as a result of Mike’s vulnerability. River Phoenix doesn’t look at Reeves, wraps his arms around himself, assumes a fetal position, and rocks back and forth as he exposes his true feelings toward his friend. What I’ve just described is the artifice that Phoenix adds to a performance that is otherwise more naturalistic and more believable than that of Spacek and Wilkinson. In assessing the earlier performances of Gerwig – and I’ve seen the films he references – in light of Greenberg, Scott later suggests that “you begin to intuit a degree of calculation and craft beneath the spontaneity and sincerity.” In other words, he acknowledges that Gerwig is “acting.” By the same token, it would be naïve to think that a Warhol superstar such as Edie Sedgwick isn’t acting or playing to the camera in such films as Kitchen, Poor Little Rich, Beauty # 2 Restaurant, Afternoon, Space, or Outer and Inner Space. Edie is very different in each, and in audio recordings Edie’s personality diverges even more from anything I’ve seen of her on screen. As Erving Goffman and others have made clear, all of us are engaged in a series of roles in negotiating and performing our lives. Roger has come back to LA from New York with a lot of heavy baggage involving his brother, former band members, Ivan (Rhys Ifans)and Eric Beller (Mark Duplass), and an old flame named Beth (Jennifer Jason Leigh, who shares story credit with Baumbach), who now has a couple of kids. Just out of a mental institution after suffering a nervous breakdown, Roger, a carpenter by trade, is preoccupied with writing letters to various companies about a litany of petty complaints. When Roger first meets his tall British friend, Ivan, he reads him one of his letters rather than engaging with him on a personal level. When they attend Eric Beller’s party, Greenberg literally sweats the whole time. Roger, however, is still hung upon his old girlfriend Beth. He even calls her from his birthday celebration after inviting Florence to join him and Ivan. Roger tells her, “My dog is sick.” She responds, “My mom is sick.” But it’s a stalemate – he can’t imagine what that might actually mean for her. Roger manages to remember all sorts of small details about their earlier relationship, while it turns out that Beth has forgotten virtually everything. Their relationship obviously meant more to him than her – he’s been stewing over it all these years and wants to rekindle it. When Roger suggests that they should make a dinner date, Beth wisely refuses. Baumbach’s risk in Greenberg is that not everyone will be amused by someone so angry. Coming to terms with adulthood and a life you never planned might not be easy, but everyone else his age but Roger has made the transition. On the other hand, Florence remains remarkably cheerful and upbeat despite her low-status job, a singing career that’s nowhere, her crush on a lunatic, and experiencing a traumatic event that she endures without complaint. Baumbach’s spin in Greenberg is putting these two different generational world views in conflict, which is also reflected in the acting styles. Ben Stiller is doing traditional comedy, while Gerwig excels at humorous naturalism. My guess is that most audience members will side with Florence, who’s quite likeable, rather than a self-absorbed character with an early mid-life crisis. Critics have been proclaiming the death of mumblecore almost from the moment the term was coined by Andrew Bujalski’s sound mixer, Eric Masunaga, in 2005. A. O Scott writes: “It will be interesting to see how far Ms. Gerwig can go and also whether the aesthetic she represents will continue to blossom and cross-pollinate with other, older strains in American cinema.” He sees Baumbach’s Greenberg as suggesting “an intriguing transgenerational entente.” A more cynical view might call this a form of cooptation. Since posting the above entry on Greenberg, I re-watched Hannah Takes the Stairs in order to take another look at Greta Gerwig’s performance. Joe Swanberg’s film is about a young woman, Hannah (Gerwig), who gets involved in multiple relationships over the course of a summer in Chicago. Why? We aren’t sure, nor is Hannah, other than the fact that she’s young and confused – a bit like Florence. Hannah dumps her current boyfriend Mike (Mark Duplass), who has quit his job, when she’s realizes she’s unhappy in the relationship. The reasons given are that she resents the fact that Mike is funnier than her and that he doesn’t even know the names of her sisters. Hannah drifts into another fling with her office mate Paul (Andrew Bujalski). He’s supposed to be a hot new writer, but, as in his own Mutual Appreciation, Bujalski plays a nerdy intellectual. Hannah soon tires of Paul as well, presumably because he’s not really there for her. Hannah finally winds up with another co-worker Matt (Kent Osborne). When he confesses to her that he’s on anti-depressants, Hannah has a meltdown. Although much of the film feels as scattered as the characters, this scene with Hannah is the one where her acting talent is most obvious. Hannah tells Matt, “I tend to leave destruction in my wake.” When Matt asks her how things are going with Paul, she stares out the window rather than at him and suddenly begins to cry. The camera stays very close to her. Hannah talks about using him. Matt tells her he doesn’t even know what she’s sad about. Hannah responds, “I don’t know. I just feel like I’m seeking too many people out.” She talks about the manic nature of having crushes on people and her regrets after acting on those impulses. Four and a half minutes later, Matt unlaces her black sneakers and the two begin kissing. Hannah realizes that she’s using her looks and sexiness to cause other people pain, but she nevertheless feels helpless to do anything about it. For the record, Swanberg and Gerwig’s Nights and Weekends (2008) – the film to which Seitz is alluding – grossed a total of $5,000 at the box office worldwide (Hannah Takes the Stairs did $25,000). Andrew Bujalski subsequently made Beeswax (2009), a film which I consider one of the best indie films of last year. Despite generally favorable reviews, it made considerably less money than either of his previous two self-released films. Mark and Jay Duplass’s Baghead, which was distributed by Sony Classics, grossed $140,000, but Mark Duplass also appeared as the lead actor in Lynn Shelton’s more commercially successful Humpday ($428,000) and now, of course, he has a smaller role in Greenberg. But the Duplass brothers’ latest film Cyrus (2010), which played at the Sundance Film Festival in January, features name actors and is backed by the marketing muscle of Fox Searchlight. It appears to be their real bid to break into the mainstream. I’m basing this on watching the trailer and the Variety review. We’ll know for sure when Cyrus opens theatrically this July.